After all those sweet treats from Halloween, do you feel like you have a smile that will scare people? Why not book an appointment and see how we can get you back on track! 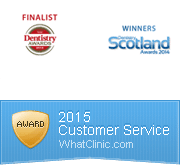 We are one of very few dentists in the Dundee and Angus area who offer 2 late evenings and Saturday appointments, have free parking and carry out domiciliary visits for mobility impaired patients. Are you still thinking this sounds great but I don’t have time to phone and register … We have taken that hassle away with our online booking system, just click the ‘Book Now’ button above.